Summer Star Wars sets revealed! LEGO has revealed images of four upcoming Star Wars sets on their Facebook page. These include 75214 Anakin's Jedi Starfighter, 75216 Snoke's Throne Room, 75218 X-wing Starfighter and 75220 Sandcrawler. Update: The Brick Show team are at the Fall LEGO Event today where many of the sets that have been revealed over the last couple of days are being displayed. So, if you want to find out more about them, check out their videos on YouTube. Let us know what you think of these sets in the comments. I LOVE the new redesign of Anakin's Jedi Starfighter! Can't wait to get these! More Clone Wars! The new X-wing is amazing! Biggs! This + HP sets = my wallet taking a beating. Snoke’s Throne Room will be mine! Ive been posting them all day! I love Star Wars: The Clone Wars, so Anakin's Jedi Starfighter is a must have for me. It's fitting to have a remake of such an iconic Lego SW TCW set on the 10 year anniversary of the series. It'll go well with Obi-Wan's Starfighter with Hyperdrive from last year. I really like Snoke's Throne Room, but the set is mega overpriced. I can only imagine the popularity of the scene, the inclusion of Jedi Rey and Snoke, and the new molds for the incredible Praetorian Guards boosted the price up. Nice companion to the Death Star Final Duel (this one actually gets the elevator right). The new X-Wing's pretty cool, though they need to cut back on making so many X-Wing sets (3rd one in only 3 three years). I especially like the new mold for Rebel pilot helmets (though I do feel sorry for those who have been collecting them all these years: they're all obsolete now) and the fact we're finally getting a new Biggs Darklighter minifig. The Sandcrawler is nice, but I've never really cared for the vehicle in-universe and the minifigure selection is quite lacking IMO. Pretty solid wave so far: though we've only seen like half of it at this point. how many x-wing releases are we up to now? this like, the tenth iteration or something? loving the snazzy praetorian guards though! Am I the only one who’s disappointed by these? I really wish I wasn’t but they aren’t all that exciting. The X-wing is undeniably nice but as with 3/4 of these, it is a remake. The sandcrawler is an affordable version of its far better UCS counterpart, but the biggest disappointment for me is that throne room. Sure, the praetorian’s are damn near perfect, but it’s without doubt the most menacing, evil looking room in the film with its gleaming red colour scheme and this set just doesn’t capture that at all. It just looks, bland. I find it funny (for me at least) that the set I was least anticipating, Anakin's Jedi Starfighter, actually looks like the best out of this wave, especially for just $20. The sandcrawler looks fine, though I don't have room in my Lego budget for it, the X Wing looks like the 2 other sequel trilogy ones, and the throne room is not what I was expecting it to look like, wish it looked a bit more complete with some red cloth perhaps? Wow that throne room is expensive for what you get. Yeah I think I did the Throne Room a bit better..
Love the new art on the sets. They look incredible! Snoke's Throne Room looks excellent and I'm diggin' that smaller versioned Sandcrawler. Get pumped! These are awesome! @Bycougars Most sets tend to eventually get discounted 20% on Amazon but that is still $56 for the throne room. Oh man, that X-wing looks incredible! The Throne Room should come with 2 more guards at that price. Snooke's Throne seems a little cramped. The CW Starfighter looks great but I'll pass since I have the 2014 from III. I wonder if this will be my first X-Wing. I never had the money so far to acquire one since I was a little child. YES! 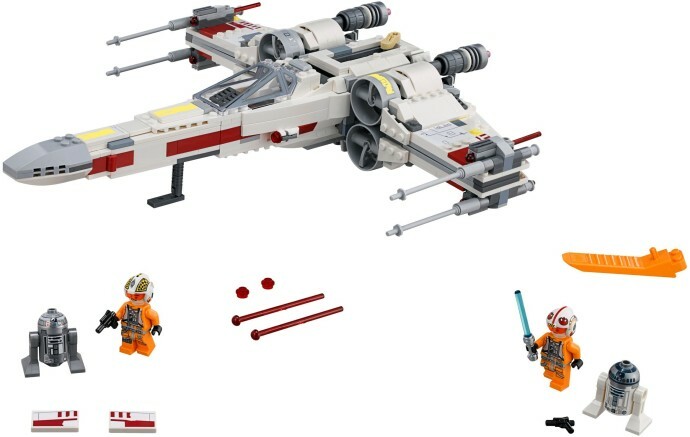 I'm completely hooked on the X-Wing and though I don't plan on getting the Sandcrawler, I'm glad LEGO finally made that orange R5 unit. YES, the throne room is real!! The other three look awesome two! An affordable Sandcrawler? Yes please! Seems like a pretty good wave of sets! $70. Snoke’s Throne Room is $70. Seventy dollars. That has to be a joke. From first glance I thought it would be a nice cheapish $35 set that’s main draw is the figures. But $70 for a huge hunk of grey plates and a chair, are you kidding? The most iconic parts of the room are the large red walls and those are only present on the box art! The only red present in the set are the useless pieces used to raise the floor. (and the price by a good $20) I’m annoyed. The X-Wing looks good though. Sort of misleading to show Rey and Kylo Ren fighting in the throne room, though I suppose Snoke needed to be in the box photo. The action doesn't play out that way, though. The throne room is a keeper. The rest are just more Star Wars rehashes. You would think the “experts” designers could manage to get the R2 unit facing the correct direction after 7 tries - but I guess it’s just not worth the effort. The X-Wing is the only interesting SW set there from my perspective, my Rebellion needs Biggs but as the Tie I'll wait for a discount. The X-Wing looks great, but I feel like I just bought an X-Wing (2012's #9493) so I'll be passing on that. They definitely took some cues from the UCS, though--especially those intakes. And I do love the Jedi starfighter but oddly enough, I still feel like #7143 from way back in 2002 holds up pretty well so I'll be passing on that too. The X-Wing looks pretty good. Finally, updated helmets and a Biggs! The sandcrawler looks neat. A little pricy though. Anakin's starfighter — yes! And a live-action styled version of his Clone Wars Seasons 1-3 outfit? Yes! Finally a decently sized sand crawler! I love it! I really wanted the last one but it was just too big and too much moola. I have no interest in the sequel trilogy sets but that throne room is impressive. I really liked this new wave, Sandcrawler and X-Wing looking very good. Forced perspective on the Sandcrawler is masking it’s true shape - need to see more set pics of this. I was very close to buying the UCS but simply couldn’t convince myself. Keen to see if I’ll bite the bullet on this one. Ah... Snoke’s throne room. Dear oh dear. Great selection of figures, but I have to echo sentiment here and say it looks like a £30 set. The price is baffling. Worst of all, the design direction feels so wrong. Instead of a cramped square, remove the lift section and have an open semi-circle - echoing that stunning shot of the throne and guards we’re introduced. Red drapes, two more guards... Such a shame. Still, a couple of nice, fresh offerings here. Will definitely wait for sale pricing on the throne room. The angle that the photographed Anikan's Starfighter from seems odd, at leat compared to previous box arts. Snoke's Throne Room is fantastic! Sure it only comes with two guards, but if the Episode VI guards are anything to go by a battle pack will fix that soon! Love the smaller Sandcrawler! I've always wanted one. Probably won't get any of these thanks to HP, but they're still nice. It will take some time to get used to that new Rebel Helmet in the X-Wing. We have had the classic one for so long, its strange to see this new one now available. I personally don’t think a smaller sandcrawler is desirable, but I see the apeal for bringing the cost down. That being said, it still looks overpriced unless the angle is making it hard to gauge the size. They seem to have perfected the x-wing though. Everyone complaining about the price of Snokes throne room, but nobody bats an eye at $80 for an x-wing? Weird. But yeah for the price the throne room could use a lot more. The red walls defined it, and they’re completely missing. That X-wing does look great, but there are a few things I'd like to see different. The laser cannons seem to have taken a step back from 2012; they are too short and look incomplete. Second, I'd like the spring-loaded shooters to be removed from the wings and instead incorporated into the body as proton torpedoes. They are better suited to proton torpedoes than studs, and it could make for an interesting function. Not to mention, the laser cannons wouldn't look so bulky. Finally, please... make it grey... although I know many people prefer white. Perhaps it's time to design my own X-wing! They all look fantastic! I'm not crazy about the prices though. I can’t think of one reason why Snoke’s Throne Room would be so expensive. It has less than 500 pieces, no particularly large pieces, 5 minifigures, and is not a lot bigger than the $25 star wars sets like Darth Vader Transformation and Carbon Freezing Chamber. It makes absolutely no sense to me. Honestly, the prices for sets this year not only in Star Wars, but in Super Heroes and City, have been a nightmare! I hope LEGO can find a way to lower them, because I foresee their sales dipping even lower this year. You know, we haven't gotten Original Trilogy X-Wing and TIE-Fighter sets for a while, believe it or not. Last ones were in 2012, and they're PRETTY DATED. So yeah, these are welcome! Anyway, I like that throne room for the praetorian guards so I’ll be buying it. Not sure if I need a 10th x-wing but I might have it anyway for old times sake. Last year’s Y-Wing looks similar in size to this new X-Wing. The X-Wing only has 40 more pieces, but the Y-Wing has more minifigures (including one with a one-time-use mold). So why the heck is the X-Wing $20 more? It’s ridiculous. I had been looking forward to it, but that’s just too expensive. Will do my best to get the X-wing and the Jedi Starfighter. The others are good, but I'm more of a starships fan. When I saw a couple of the prices, I literally almost gagged. 75216 Snoke’s Throne Room (492 pieces) for $70 and 75221 Imperial Landing Craft (636 pieces) for $90??? I could wrap my head around $55 and $75, respectively, but this is insane. And for those of you upset about the X-Wing’s price, it’s $80 for 731 pieces. That’s not so crazy! Snokes Throne Room and the X-Wing are what I am after. As others have said the pricing is shocking, and me being in Australia they will be even more shocking. I think I will be waiting until department store sales with 20% of. Snokes Throne Room, an incredible scene from a movie I loved, the set is much smaller than I expected, I love the guards, but there should have been 4 of them (1 of each type). X-Wing Starfighter, like with the TIE fighter/Snowspeeder and a Y-Wing I have not been interested in the UCS sets but wanted a system set of each and look forward to picking this up ...... once it’s on sale. I can't see the sandcrawler image in this articel, nor on the 75220 product page. Really surprised by how quickly people have become acclimated to the idea that an 80 dollar X-wing is justified. As Yellow, logged or not I have no picture for Sandcrawller, even on linked set page. It's probably the only one I will buy, already having previous versions of the others. Snoke 's room has not a "red atmosphere and look" enough IMO and I would have preferred Pretorians guards with classic legs. No news or pictures from Hoth medical center, Imperial landing craft and Advent Calendar? I would like to tell also that each time we have new releases or news, we complain about high prices. So I would really like to know if prices are really that high? I think that as an AFOL I will always find a big set too pricey, but how could we truly evaluate if prices have really increased or not? Thank you. Everything else seems really lazy. Anakin's ship and Snoke's throne seem pretty lazy to me. As always a mixed reception. I think I'm officially EITHER been collecting SW lego too long OR am too old. But re-releasing sets its getting a bit tiring now. Even if the new X-wing is 20% better than the last one I've already got one at this scale in White/ Red , Black & Orange and Grey & Blue. Also got a starfighter..... do like the throne room though. The sandcrawler photo is missing for me. I saw it elsewhere after reading this page, but it would be nice to have it here too. Oh man, these all look a lot better than I was expecting. I'm almost upset. I won't be able to pass up Snoke's Throne Room after all - all of my most wanted Last Jedi minifigs in one cool location set. Ouch. Brick’t - if you are feeling tired by the new sets why not try and take the best improvements of the new sets and modify your old version - best of both worlds and you don’t need to spend too much! That is what Is great about Lego. Will be interesting to see how lego sells the toys r us figure packs. No doubt they have aleady been produced. Really want the Harry Potter one especially. I absolutely love the Sandcrawler and the Classic X-Wing. The rest I don't care much about. Bit disappointed with the X-Wing. They made some improvements, e.g. the engines and the canopy, but it still has a lot of problems. I wish they changed the nose design to something more accurate. The guns don't look great either. And they shouldn't have used that new slope piece on top of the engines. Will still be copping though. Need an upgrade from my 2006 one. @Brick’t -glad to help! My Lego room needs a lot of work as well! Anakin’s Jedi Starfighter actually looks dang nice for just $20. Snoke’s Throne Room looks pretty good, but there’s no way I’ll buy it at full price. The X-Wing is fine, but X-Wings are boring these days. The Sandcrawler is alright I guess, but I wish it was either bigger or smaller, right now it’s stuck in a weird middle ground between toy and display piece. I must admit, I am torn on the new rebel pilot helmets. They look great with the visor but... this kind of feels like the end of an era, as the old rebel pilot helmet has been around so long, and was one of my favorite parts to see new prints for and collect. Just add the Transparent Fluorescent Reddish Orange 1/4 dome pieces from #6983 Ice Station Odyssey to Snoke's Throne Room. First I saw no sandcrawler image, now I see two. Yes! Finally a new X-Wing! The last minifig scale one came out in 2012, the UCS model in 2013, and I have neither of those, so I am very glad to see TLG releasing this set. Definitely a must buy for me. There are lots of tiny improvements on this 2018 version compared to the 2012 model that make a huge difference! Not satisfied with the new Alliance helmets...the chin strap is also gone now. I guess I'll use the new ones for the movie pilots and the old ones for my EU/Legends pilots. Apart from that, the X-Wing is great. Will definitely pick up at least one, along with the new TIE Fighter. Looks like a low-spending summer, yay! I like the new X-wing, but I'm not sure I like it 100€ much. It would have been nice to include a ladder and hangar vehicle, as well. Or another minifig. I'm not sure I like the Sandcrawler. I don't have one, always wanted one, but it does look a bit dull. Still, I think it will be going for 80€ before xmas, what will be a fair price. It seems that the original trilogy Rebel pilots are finally getting helmets with translucent goggles instead of having goggles printed on heads - that makes them “compatible” with the sequel-trilogy ones. Not sure about their shape, though - looks a bit oversized and overly “round”. The Snoke Throne Room looks astounding and it has an impressive lineup of minifigs. On the downside, I think $69.99 is a little too expensive. It depends on whether that would be €69.99 or a more sensible €59.99. I’ll put it on my wanted list and hope for the best. This version of the X-wing looks very impressive and way more accurate than previous iterations. As for this smaller version of the Sandcrawler, it looks rather plain. And I would have liked to see a few more minifigs coming with this set. No Jek Porkins? Come on Lego! Also, where is the big magnifying glass in the throne room? X-Wing looks good, but seems a bit sticker-heavy. Sandcrawler looks atrocious, like first draft MOC where the builder is still waiting on a sizeable Bricklink order for improving it. You know, it used to be that 10¢ per piece was the average price to part ratio. Now the average is more like 12¢! I'm just dumbfounded that Anakin's starfighter is priced so reasonably when Snoke's Throne room is 40% higher than it should be! Price per piece is a poor indicator of the value of a set. How big are those pieces? How many minifigures? Look at sets from 20 or so years ago- Typically much higher price-per-piece... no cheese slopes back then! The X-Wing is 731 pieces for $80, not cheap but perfectly normal for a licensed Star Wars set. The Throne Room is 492 pieces for $70, wildly overpriced. The X-Wing is an accurate, complete model. The Throne Room looks half-sized and half-finished, at best. Lo and behold! Lego can actually do nice Star Wars sets that are not vehicles or space ships. "Snoke's Throne Room" looks really good. And seems really overpriced ... At 30% discount, I might get it. ^^And also 60169 has 9 more pieces or the same price. I'm looking forward to downloading the instructions for the X-wing so that I can upgrade my 2012 version. It looks quite nice, though I'm not a big fan of the colour scheme or of the new helmets. Nice wave but am sick of x-wings and the guardy whatever people look very good but the throne room is way overpriced. Anyone else waiting for Lego to make a Mon Cal cruiser or any other rebel ship that's bigger than 150 meters? Or ships from from Clone Wars era navies? These sets seem somewhat poor for me. The Anakin's starfighter has a nice build, The X-wing seems a bit small and forgettable, Snoke's throne room seems a waste of money (Similar to the Scariff and Takodana sets) and the sandcrawler just looks sort of wrong for a reason I just can't put my finger on.